Microsoft has announced its own online game streaming service: Project xCloud. The gaming world is changing, and we’ve seen the likes of Blade’s Shadow, Nvidia’s GeForce Now, Playstation Now, and even Google Chrome’s own browser-based streaming solution gain traction over the last year. And now Microsoft, the PC and console giant, will join the list of hopeful tech companies fighting for streaming supremacy. While technically an Xbox streaming service, Microsoft has been set on opening up its gaming library to more devices than just its own proprietary hardware as of late – with Windows PCs some of the first to benefit. This move looks to be similarly targeting the platform boundaries we’ve been locked behind for so long, instead opening up the Xbox library to more devices than the company’s dedicated hardware can reach alone. 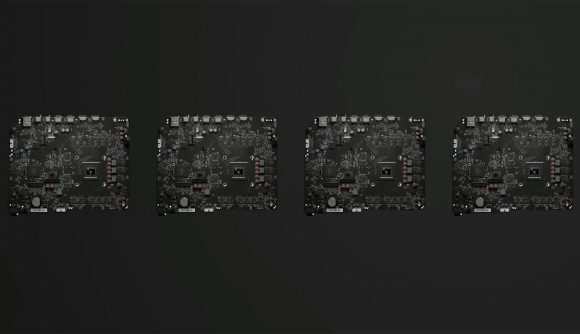 Project xCloud will use custom server rack hardware to power the experience – all based on existing Xbox One console components. That means custom AMD GPUs and accompanying memory will be the workhorse keeping Microsoft’s cloud gaming servers ticking over. This looks to be a big win for AMD – most cloud servers we’ve run into so far have employed Nvidia graphics cards for the grunt work rather than team red’s tech. AMD works closely with both Microsoft and Sony on their respective Xbox One and Playstation consoles. AMD’s Navi architecture, arriving sometime in 2019, was even rumoured to be making its way into a future Playstation 5 console. But it’s the software developments that might interest us PC folk most of all. Latency poses a huge challenge for anyone developing a streaming service, or indeed playing one, but Microsoft reckons it has the best expertise and access to deliver a stronger streaming service than ever with Project xCloud. Microsoft is developing low-latency networking, encoding, and decoding advances to combat the issue of latency and poor quality. It aims to deliver “high-quality experiences at the lowest possible bitrates that work across the widest possible networks”, and that includes a promise for 4G and 5G rollout, too. The current Project xCloud ‘test experience’ is running at 10Mbps, which is impressively low. Blade’s Shadow is one of the market leaders in this regard at 15Mbps, and it’s not unlike a streaming service to require upwards of a 25Mbps downstream connection. However, we don’t know exactly what quality, framerate, resolution, etc. this experience was running at, so a direct comparison cannot be made this early in the game. Microsoft looks to be planning a rollout across every Azure data centre location worldwide, encompassing 54 ‘regions’ and 140 countries. Microsoft has already rolled out its custom server racks into one of its data centres in the US, and public trials for the game streaming service will begin in 2019.